Item is a photographic postcard of stone guard rails on the Cabot Trail at Big Intervale. 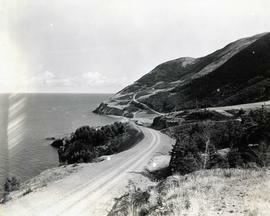 Item is a photograph of Big Wash, on the Cabot Trail. Item is a photograph of a view of the Cape Breton Highlands National Park, near Ingonish. Item is a photograph of Stella Paruch and Mary Kulinicz on the Cabot Trail. Item is a photograph of Cape Smokey. Item is a postcard of Cape Smokey, looking from the Cabot Trail in Cape Breton. Item is a photograph of Cape Smokey, displaying mountains and ocean. Item is a photograph of French Mountain, Cape Breton. Item is a postcard of MacLean's Farm at the foot of North Mountain in Grand Anse Valley (Pleasant Bay) on the Cabot Trail. Item is a photograph of Grand Falaise in the Cape Breton Highlands National Park before the road was paved. Item is a photographic postcard of Harnord Lakes, at Lake O'Law. Item is a photograph of the hills of North Cape Breton taken by W.R. MacAskill of Halifax. Item is a photographic postcard of the horseshoe curve on the Cabot Trail. Item is a photograph of the Horseshoe Curve on the Cabot Trail. Item is a photograph of the administration and engineers offices at the Cape Breton Highlands National Park. Item is a photograph of Ingonish Beach. Item is a photographic postcard of Ingonish Beach. Item is a photographic postcard of Lake O'Law. 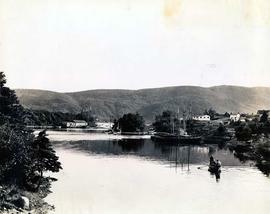 Item is a photograph of a view of Lake O'Law, Cape Breton. Item is a photograph of a view of a thatched roof and part of one stone wall at the Lone Shieling in the Cape Breton Highlands National Park. Item is a photograph of Ingonish Harbour with small boats, wharves, small lighthouses and fish houses. Item is a photograph of South Ingonish Harbour with several ships at anchor in the foreground. Item is a photograph of Sunrise Valley near Cape North on Cabot Trail. Item is a photograph of Sunrise Valley in the Cape Breton Highlands.